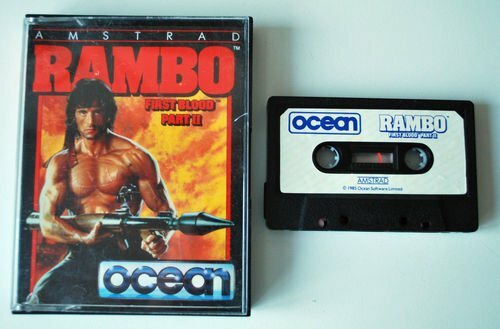 The film grossed massive amounts at the box office and doubtless Ocean are hoping it will do the same sort of business on ; computers. What the game lacks though is the sort of nationalism and gore that made the film so controversial. Their omission : leaves the game as just another blast-em-up. Our all-American, commie-bashing, muscle-brained hero is on a mission to Vietnam to find American prisoners. He disobeys orders and tries to rescue them, which is of course where you come in. Rambo begins his mission to the South of the POW camp in a jungle positively swarming with Viet Cong and has to complete five stages in order to rescue the POWs. Initially he is armed with a knife, bow and arrows and explosive arrows but along the way three other weapon systems can be picked up - machine gun, grenades and rocket launcher. These are best used in different situations, the noiseless ones particularly because they don't attract so many of the enemy to your location. 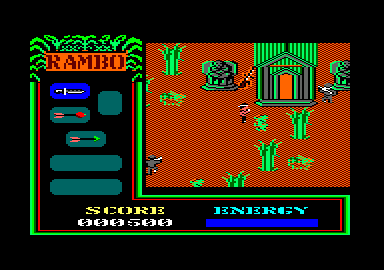 The enemy will shoot at Rambo wherever he is so that you are under constant pressure to keep on the move. When hit his energy is decreased and if it reaches zero the game is over. The enemy can be killed in two ways: either with the weapons you carry or by just running into them. 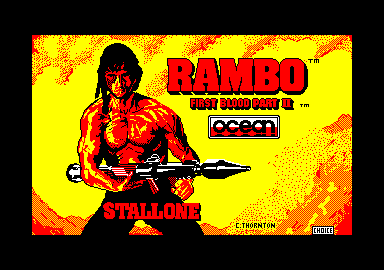 As Rambo moves around the screen scrolls in the direction he is heading. Controlling the movement itself is the hard thing because it is difficult to get diagonals and our bandoliered hero can easily get stuck behind vegetation. This can prove frustrating since a static Rambo will take a lot of hits, rapidly decreasing his energy. Once inside the POW camp a single prisoner has to be rescued using the knife to cut him free. You then have to go North out of the camp to a clear area where a helicopter is waiting to pick you up. 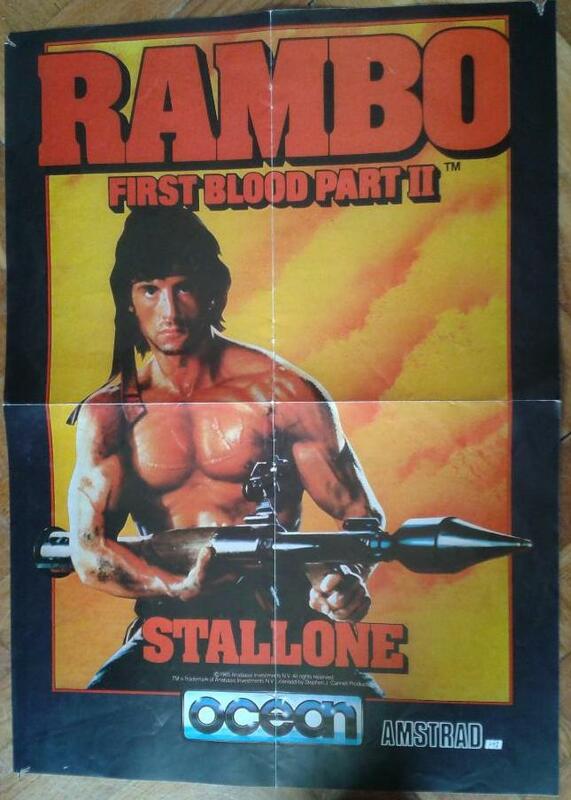 Rambo then has to fly back to the camp to rescue the rest of the prisoners. This is easier said than done since they are quite hard to find and again have to be released using the knife. Once the prisoners are on the chopper the score will have taken a hefty jump and all you have to do is battle an enemy gunship. This appears on screen and launches rockets at the chopper, which have to be replied to with your own rockets. Hits will again reduce the energy rapidly. This is replenished at each stage but a couple of mistakes on any section will probably result in your downfall. Games are completed very quickly and you'll only get further through perseverance and a lot of trial and error. The scrolling graphics are reasonable but the music and control are irritating, control in particular causing a lot of frustration. It's in a similar vein to Who Dares Wins II but loses out because it has less variety, less control and less to do.